It's Facebook Fridays! for September 11, 2015 -- Labour Day is over and it's time to go back to work! Do you need a job? Want to turn a temporary position into a full-time career? Hope to avoid being laid off? Lucky Mojo can help! 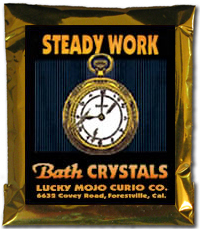 Today we are giving away 3 hard-hitting Steady Work Spiritual Supply prize packages -- each pack containing a bottle of hand-made Lucky Mojo brand Steady Work Dressing Oil and 1 foil pack each of Steady Work Incense Powders, Steady Work Sachet Powders, and Steady Work Bath Crystals. 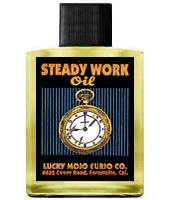 First thing tomorrow morning, we will select THREE winners at random, announce their names here, and ask them to message this Facebook Page with their mailing addresses, so we can send them their FREE Steady Work products. We have a winner! In fact, we have 3 lucky winners! Our Facebook Fridays! winners for September 11, 2015 are: Teresa Jauregui, Leigh Crutchfield, and Aaron Marsh.